A collection of articles to help in the understanding of Lucifer and the impact he will have on the future of humanity. "Everybody will love the demonic choir," said Aaron C. Donahue. "The music is beautiful beyond words. It is the gate of Lucifer. It is technology that opens your mind and heart." Donahue plans to organize a band that will offer the 72 tones of the Goetia Spirits to the world. 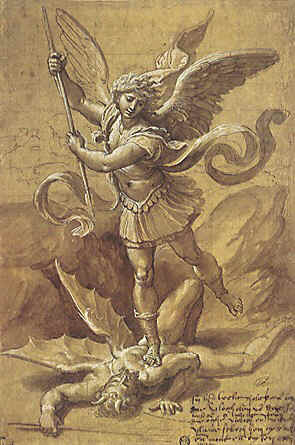 Aaron C Donahue has discovered that the old Christian nemesis Lucifer is the alien who started it all. He writes: "Lucifer is the true father of the human race." Not only this, but Donahue believes Lucifer has returned to take a remnant of his family out of harms way as the armies of the world blindly prepare for the nuclear destruction of their planet and themselves. 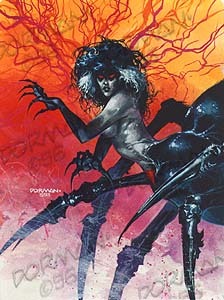 When we lived among the Navajo in Arizona we heard the stories of Spider Woman, who was the great creator of the people. Our host, a wise medicine man named Raymond Begay, once took us out along the rim of Canyon de Chelly and pointed to a tall pointed rock formation where he said Spider Woman lived. In one of his recent radio messages, Prophet Aaron C. Donahue pointed to a Bible verse in the Book of the Revelation that attributes a strange quote to Jesus. In Verse 16, Chapter 22, Jesus proclaims: "I, Jesus, have sent my angel to testify these things to you for the assemblies. I am the root and the offspring of David, the Bright and Morning Star." 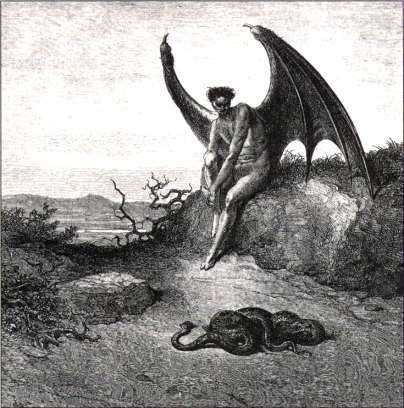 Christians mistakenly believe Lucifer is the name of a fallen angel cast out of Heaven by God to become an evil red devil called Satan. There is nothing in the historical record, or even in the Bible, to substantiate this story. Quetzalcoatl is to the New World what Christ is to Europe: the center of a religious cosmology and pre-eminent symbol of the civilized nations of Mesoamerica. Both men were considered to be men who ascended into heaven upon their death; Christ to sit at the right hand of God, Quetzalcoatl to become the Morning Star, the name depicted for Lucifer. The entity called itself Abba Father when it came to us unexpectedly on the evening of November 18, 2003. It was not physical contact. Its words began to flow from the lips and pen of my wife, Doris. Doris is a sensitive, or clairvoyant who has talked with entities on other plains for many years. This entity identified himself as the one we call Lucifer; the progenitor of the human race. Our second evening session on November 19, 2003 with Abba Father was severe. He said: "Long ago the world was nothing. It was turned over to a system of ape-looking beings. They could not rule over Earth so another code was given to them. Structured like me, DNA was given to them in another form. Quickly they rose upward (developed human intelligence and awareness). Many became human; not servants but kings." The Abba Father said he was not a god, nor an angel, but an alien being from another place. He said the work he did on Earth was because of love. After the Anunnaki came and the race was polluted with darkness, the veil was dropped so that mankind could no longer see the spirit world that exists around it. "They were barred from all truth so they made their own world and all laws were manipulated by them," he said. "Within each of the humans on Earth is God. No where else. You are all the same. No one can be any other. God is you. Fear is not to be in a god. Only the angelic beings are fear based. They cannot stand with a human who knows who they are. So God is your true being in mind and heart and body. All are gods. Trapped are the angelic ones who do not know they are beings that cannot claim the godhead." The Abba Father had another message in 2003 that was not given to you right away. It was about the American assault on Iraq and the bombing of the origins of humanity that were stored there. Ruined may have been evidence of who we really are. Information that would have destroyed Christianity forever. Aaron C. Donahue has said that if the Earth is suddenly destroyed by a total (man made) cataclysmic event, there will be an alternative way out for a select few. Aaron believes there may be a portal, or a way of escape for a certain number people. He calls that portal an interesting name; Project Eden. As more and more UFO sightings are reported around the world, and more and more stories about alien abductions and sightings make their way through the Internet, people are starting to wonder just when and how we will make our first public contact with a race of intelligent beings from another world. Demons and angels are aliens. They are the same. They battle each other because there is a need for balance. It is the age-old principle of Yin and Yang. Neither side is good or evil. They are just two sides of an issue. Their presence brings balance and order. Does Lucifer Have A Counterpart? If there is a balance to all things in the universe, and Lucifer is a super being that is higher than the angels and a gateway to the highest information system, or God, then Lucifer must have a counterpart. Who or what is this being? Was it involved in creating the current human condition? Who was Solomon, how did he gain power over the demonic kings, what did he use them for, and how did he bind them when he was through with them? Lets get to the bottom of this ancient fable. There are many stories about an invading force of powerful beings that dropped down out the sky to earth many thousands of years ago, changing life for the human race forever. A reader recently challenged the validity of the name Lucifer as the true name of the alien entity that brought his DNA to Earth and started the human race. The story can be traced to an ancient Canaanite myth. The late Anton LaVey, notorious leader of the Church of Satan, created his "church" to mock Christianity. Yet there is genius reflected in his Satanic Bible. The document lists nine points that can easily be used to help clarify the Luciferian position. The old battle between Creationism and Evolutionists is rearing its ugly head once more after a silence of more than a century. Both sides are wrong but the truth is thought to be so repulsive it is being severely suppressed. A researcher at the prestigious Howard Hughes Medical Institute says he has found genetic evidence that the human brain evolved at an “extraordinary speed” when compared to the brains of other animals. There is a personal angle to the story of Ganesha, the strange Hindu elephant-faced deity of India. Aaron C. Donahue says it is the image of a midwayre, a strange entity that really exists on the Earth but outside human awareness. In his second consecutive Internet radio broadcast, Aaron C. Donahue was joined by his sister, Jennifer Sharpe, in calling forth people “of our kind” to separate themselves for a spiritual awakening in the name of Lucifer, the real progenitor of the human race. Aaron C. Donahue says this entity, the 68th Spirit of the Goetia, is on Earth today as a genetically manipulated human. He is Lucifer's envoy, placed here to help bring about a one-world government. During his Sunday broadcast, Aaron C. Donahue said the new world government will be socialistic when it forms somewhere in Europe in the next few years. The concept of reincarnation, or the rebirth of a soul in another body following physical death, is ingrained in the human culture. It is a pagan belief. It also is taught as part of Hinduism and a form of it is even believed by the Buddhists. But do we come back? Are We Citizens Of Mythological Atlantis?